Wondering what are the benefits of upgrading and when’s the best time to do it? In this handbook, we’ll uncover the advantages you have if you choose to migrate your store to Magento 2, to put an end to the controversies that overshadowed any reason to do so since November 2015 when Magento 2 was released. In this guide, you’ll discover what steps you need to follow to improve your website’s performance, provide your customers with a more secure and appealing shopping environment, and take advantage of all the features Magento 2 offers, to make your business stand out from the crowd. 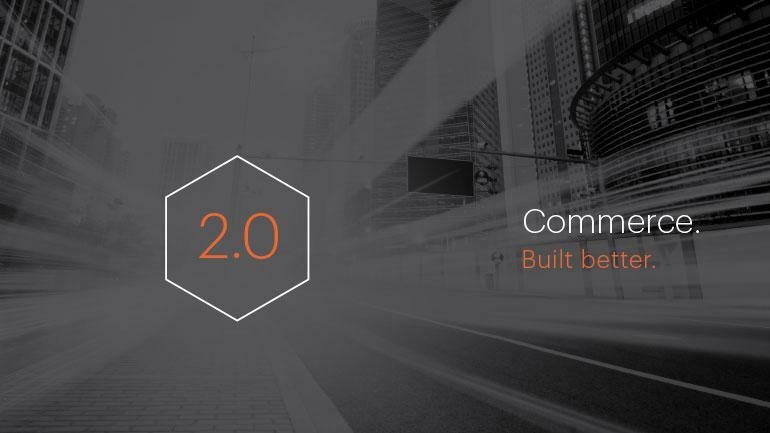 Learn what makes Magento 2 the eCommerce platform of the future, and find out how switching to Magento 2 can improve your business success rate and achieve a higher ROI. eCommerce industry constantly evolves by improving the ways in which merchants are developing their online businesses, in their attempt to reach a wider and wider audience and enhance their profit. Magento systematically improved the platform to make it suitable for any type of business, launching numerous updates for all platforms, from Community to Professional and Enterprise. Regardless of the version, you are currently using, it is recommended to constantly stay up to date with the newest updates if you want to improve the quality of your store, benefit from various enhancements, eliminate vulnerabilities of precedent versions and extend the functional aspects and design elements of your website. Although migrating to Magento 2 can mean building some parts of your store from scratch, the benefits outweigh the disadvantages and the efforts you invested in this transition, by constantly adapting your site to Magento standards, to build a better retail experience for customers and for the admin. Lately, Magento 2 has be has gained more and more attention among merchants and eCommerce experts anticipate that it will further grow in the years to come. Only in May 2017 523 shops were developed on Magento 2, and other 13,801 Magento 2 web stores are on the entire internet, and most of them migrated from WooCommerce to Magento 2, according to BuildWith.com. Even so, there still are some reasons why entrepreneurs tend to refrain from upgrading to Magento 2, and these are usually related to the resources they need to allocate to make the transition, such as choosing the best developer for their web stores and investing the time in making the switch, but the biggest concern is related to the capability of the new platform for supporting the old extensions. However, all these reasons will soon be left behind, when Magento will stop adding new features to Magento EE 1.x versions. After November 2018, when Magento initially announced that they will no longer offer support for Magento 1x versions, all stores developed on this platform will be exposed to security problems, simply based on the fact that there will be no available updates for Magento 1.x versions, so your web store will become more vulnerable to malicious attacks, security issues, and errors. More than this, keep in mind that the support you currently have from Magento community will soon enough come to an end, as developers shift their attention to the new Magento version. Ultimately, the decision to re-platform to Magento 2 comes down to the resources you have spent on customizing and developing your current version of the store, and the available extensions you have on the new platform at the present moment. Analyze whether the themes and extensions you are now using are available in Magento 2, and if this is not the case, it is probably best not to rush with the migration just yet. After all, there is still enough time to make the transition, as Magento also expressed the intention to continue the support for at least 18 months after November 2018. But keep in mind that at some point in the near future you’ll come to realize that moving your store to Magento 2 is inevitable, and it might be exactly what your business needs to thrive. In this sense, the sooner you decide to make this step, the better. Start by planning the upgrading process and identifying the lowest traffic period of the year to make the switch from Magento 1 to Magento 2, so that your sales performance will not be affected. If you need assistance from Magento certified developers, you can call the experts to help you migrate your store to Magento 2 more rapidly and successfully, so that you and your customers be satisfied with the results. As you come closer to the inevitable migration there are some things you need to take into consideration before going any further with the upgrade. Visit Magento Marketplace and find out what are the latest extensions that Magento 2 has made available for its users. As extensions are an important component of Magento based shops, it is advisable to keep up to date with the latest news on the new availabilities you have, so the transition can go smoothly, without any lack of compatibilities, and your business can grow stronger by taking advantage of the all the powerful features the new platform offers. Analyze your current web store to determine how challenging the migration process will be in your case, by taking into consideration the following aspects of your site. What Magento version you are currently using? If it’s too old or highly customized, the risk of having some migration issues increases, so it is necessary to consult the expert’s opinion on what strategy it’s best to adopt for migrating your store. What extensions have you installed to your website? If you are using multiple extensions and they weren’t already tested on the new platform, migrating to Magento 2 can raise further functionality issues, so it is advisable to ask for the developer’s advice on how you can adapt the migration plan to your situation. Also, before migrating it is recommended to check if all the extensions you have installed in your store are helpful for you, as this is an opportunity to clean your website of all the things you do not currently need that can also slow down your website. If your website does not have an advanced customization, you can use Code Migration Tool to run an automated migration on your store and reduce the manual effort of setting up and running the migration process. Read more about the Code Migration Tool below, on Magento 2 Upgrade Tools section. Does the server you are currently using support the system requirements Magento 2 demands? If not, you should consider changing your host provider. Upgrading to Magento 2 can be a long and difficult process, so carefully planning ahead your migration strategy and choosing the right time of the year to do it is necessary to benefit from a fast and secure transition, without worrying that it might affect your sales. 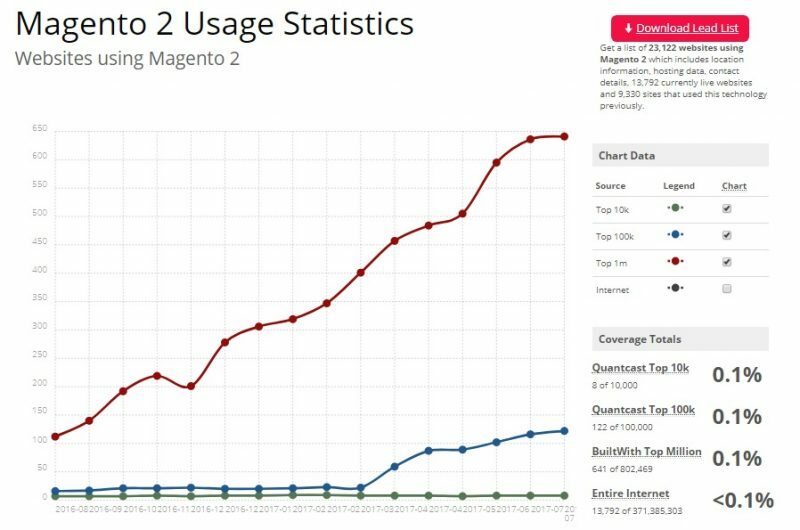 Although Magento experts estimate only a 20% increase in time and efforts for Magento 2 upgrade, compared with other available upgrades for 1.x versions, the duration of the upgrading process directly depends on a number of factors, such as: the level of customization your store currently has, the size of your shop and the data you want to transfer, the capacity of your catalog, the extensions you are using and the available extensions in Magento 2. Developing a strategy that best fits your marketing plan can require the expertise of a certified Magento developer, to avoid migration errors that can immediately impact your sales performance. Are your ready to upgrade your Magento store? Before proceeding with the upgrade, create a database backup of all your store’s content to connect it to Magento 2 database. This is a necessary step that prevents you from losing important data during the migration. Data loss can sometimes be an irrecoverable process, which may take place if you choose to connect your database to the new platform live, without first making a database duplicate. After duplication your database, you can analyze it and remove all unnecessary data, such as old promotion details, logs, lists of compared products, and so forth. This is the most important stage of the migration process, as all your store’s data will be copied to the new platform: products and product categories data, customers data and private info, orders data, store configurations, and so on. To successfully migrate your store’s data to Magento 2 you can use the Data Migration Tool. Read more about it in the next section. Not all Magento 1 extensions are available in Magento 2, so at this stage you should check Magento’s Marketplace to find the extensions you can use to improve the functionality of your new web store. However, the custom code you use in your Magento 1 store is in most cases compatible with Magento 2, and depending on the level of customization of your store, the code will either be migrated to the new platform or rewritten. In this sense, to make your job easier and reduce the efforts and resources you invest in this transition, Magento has developed a Code Migration Toolkit, that you can use to will help to port your extensions and custom code to Magento 2. You’ll read more about it in the next section. Another important stage of the migration consists in rebuilding your store’s environment to the new platform or taking the opportunity to change your site’s appearance, as Magento themes cannot be migrated from version 1 to version 2. Magento 2 introduces new user-friendly technologies and responsive design that you can take advantage of in creating an appealing environment for your visitors to make them come back again and again. Once you choose to migrate to Magento 2 you should be aware that your website’s theme will need to be build up from the start, as the new platform has a totally different structure from Magento 1. The positive aspect is that this is a good opportunity to change the way your customers see your business, and even expand your target audience, by redesigning your website so that you can offer your visitors a new and exciting experience. However, this step implies hiring a developer, as you cannot migrate your Magento 1 theme on the new platform. If you’re not yet ready to do this, you can choose to install one of the themes Magento made available for all Magento 2 merchants. Are your ready to upgrade to Magento 2? You can use Data Migration Tool to transfer all your data from Magento 1 database to Magento 2 database: product, order and customer data, CMS pages, store configurations, tables, promotions, customer passwords, and URLs. It verifies the consistency between the two database structures, namely between tables and fields, and tracks down the progress, verifying each step of the procedure. Data Migration Tool helps maintain data integrity and minimizes the downtime of your store while data transfer is in progress. LitExtension Tool is an automated shopping cart migration solution that can help you move your data from Magento 1 to 2. Using the software does not require any training or programming skills to make the platform switch. Using LitExtension Tool your store data will directly be copied on the new platform, without any third party systems involved. The tool guarantees you’ll have no downtime for your current Magento store and a safe migration module, which preserves data loss in case the process stops due to server or networking issues. Cart2Cart is another automated migration tool that you can use to easily copy all your data from Magento 1 to 2. Cart2Cart migration tool guarantees a smooth data transfer with no data loss and no downtime for your store. Code Migration Toolkit is a software used by Magento developers to simplify the process of converting your custom Magento code to Magento 2. Magento Code Migration Tool significantly reduces the effort of manually customizing your Magento 2 store and it automatically converts the repetitive steps developers have to make in porting multiple modules on Magento 2. Although it handles some of the most time-consuming steps, it may require manual editing for some of the generated files. Need an eCommerce consultant to migrate your store to Magento 2? If you recently performed the Magento 2 upgrade and you want to be sure that everything is in order, so that your SEO performance will not suffer and drastically impact your sales, here are the steps you need to follow after the migration process is completed. After your migration is finished, make sure that you have customized your cart emails, order confirmations, shipping confirmations, abandoned cart messages, order cancellation and follow-up messages, product review, and newsletter templates. After you have rigorously tested your new website and everything works properly, Magento specialists recommend putting your store in maintenance mode. To do this, you should create a maintenance.flag file in the root of the site. Before going back to live mode, make a test order to see if every process works as it should. Once you’re convinced that everything is plain sailing, you can lift the maintenance mode by removing the maintenance.flag file. Now that you have a thorough understanding of what upgrading to Magento 2 presupposes, what advantages you have if you choose to migrate, the next step is finding a Magento development company to assist you during the process, so that you can accelerate the transition and benefit of the improvements Magento 2 offers to all merchants. 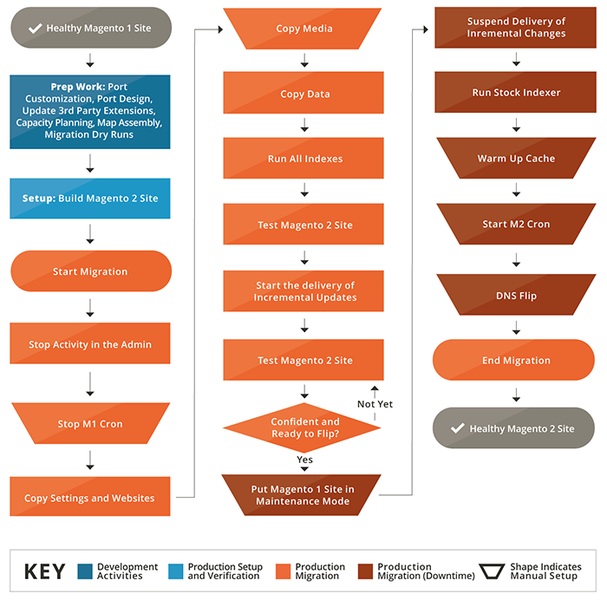 Are your ready to migrate your store to Magento 2? Don’t wait, let’s talk today!